I was feeling like a challenge so I went over to Mojo Monday to check out their layout. When I saw it, I immediately thought of September's My Paper Pumpkin kit. My finished card isn't quite like my vision, but it was fun creating anyway! I used the base with the spider web-ish design from My Paper Pumpkin and added stamps, ribbon, washi tape and a button to it. These eyeball soaps are going to my niece and nephew for Halloween. I knew when I saw them in the store they would be perfect for a Tag a Bag gift box! I folded the box up stamped a tag and was ready to go. The hardest part was tying the bakers twine without flipping the eyeballs upside down in the box. Aft first this card looks a little intimidating but with the new Circle Card Thinlits Die it is so easy. I designed this card as a Thanksgiving card, but it also worked for some of my stampers as fall birthday cards. I added a piece of my favorite retired Designer Series Paper for some additional color. There are several papers in that package that worked great with this card. This card was inspired and mostly CASED from Christina Achziger. I promised a Halloween, Thanksgiving and a fall card for my last stamp-a-stack. So I looked to Stampin' Connection which is a demonstrator only website with tons and tons of demonstrator created samples for my fall idea. I had to make a few changes in the colors and left her greeting off of the front, but this card jumped out at me right away! A lot of my stampers left it blank for a handwritten note and others made it into birthday, get well, sympathy and thinking of you cards. Discount Purchaser-Likes the idea of buying stamps for personal use at a 20-30% discounted price. Occasionally sells to neighbors, friends, and relatives. • Short-term Demonstrator- Sells for a short period of time. Wants to earn a specified amount. Stops demonstrating when the goal is met. • Seasonal Demonstrator- Works at the business during October, November and December, doing demonstrations for seasonal money. Takes minimum orders and sales during the balance of the year. • Hobby Demonstrator- Loves doing demonstrations and earning money when it’s convenient. Works a lot some months and very little other months. Likes to do demonstrations that are easy to book. 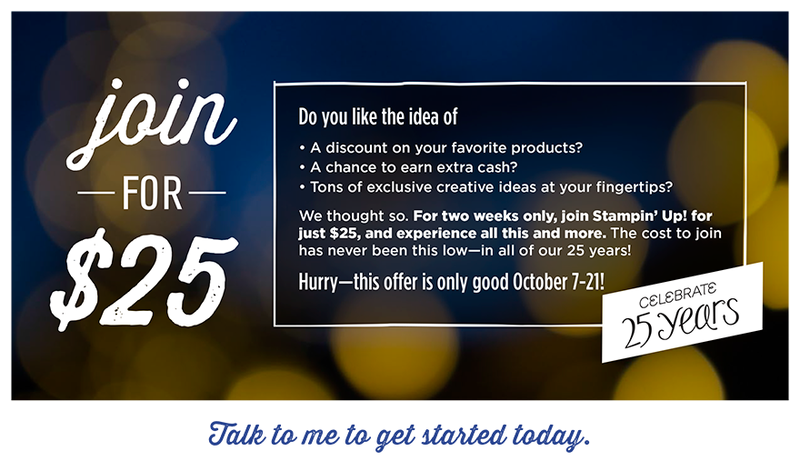 • Career Demonstrator- Views Stampin’ Up! as a viable income with a long-term career potential. Pursues management and wants to move up the career ladder. Loves attending Stampin’ Up! functions. Has developed close relationships within the business. Works at her business in a consistent and ongoing manner. There is no pressure with the Demonstrator Kit. To remain a demonstrator and keep your discount, you’d just need to have at least $300 in orders/sales between now and April 30, 2014. Pretty simple. And if you don’t make the minimum, you’ll just be inactivated as a demonstrator. But you can always sign up again later, with no penalties. I knew I wanted this Halloween Happiness stamp from the Holiday Catalog first time through the catalog. It makes such a cute Halloween card with just a little coloring (directly on the stamp). I wanted to add a little bling so a strip of glitter paper was just what I needed.